In the past 5 years I have had a lot of enhanced life experience. I am a prior service United States Army Solider. I was hand selected out of 800 Infantry Soldiers. To work w/ 23 other soldiers (the best of the best of the 800) as a Special Operations Recon and Sniper soldier. I am a combat veteran of Operation Enduring Freedom and Operation Iraqi Freedom. As a Special Operations Combat solider I learned that leadership could be the difference between life or death on the battle field. It hurts me deeply to state this is not a metaphor as some of my prior leadership before Special Operations unit did not get to come home with me. While my Special Operations leaders, team, and I came home safely even though the odds where stacked against our livelihood. Since I got out of the Army and started college in the Spring of 2005 I have been very indecisive on what I wanted to do as a career. I went through the police academy had a chance to work for the Volusia County Sheriffs Office but changed my mind on a career path. I have changed my major at least four times before I finalized on Communications. I have worked in the service industry even at management levels, motorcycle sales, at a gym, and nothing seemed to be what I could see myself doing for a lifetime and remaining happy. It has been factually proven that college students can meet a professor that makes a profound impact on their future success. This was proven to me about two weeks after I met Bart Christner. I may never have found my true life passion as a Creative Programmer (for all variants of digital media) if it was not for Mr. Christner. I took a Photoshop class DIG1109 as elective. Because course names had changed I at first had no idea that I had once started this same class before. 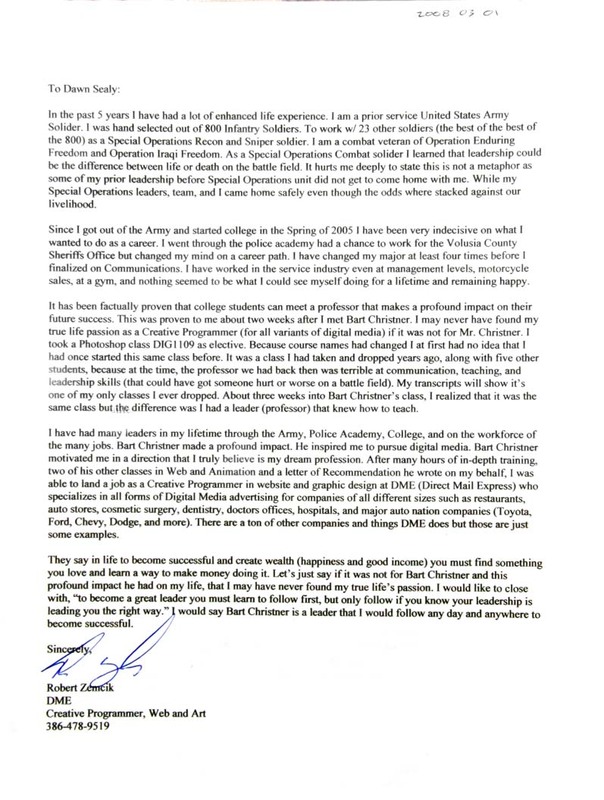 It was a class I had taken and dropped years ago, along with five other students, because at the time, the professor we had back then was terrible at communication, teaching, and leadership skills (that could have got someone hurt or worse on a battle field). My transcripts will show it’s one of my only classes I ever dropped. About three weeks into Bart Christner’s class, I realized that it was the same class but the difference was I had a leader (professor) that knew how to teach. I have had many leaders in my lifetime through the Army, Police Academy, College, and on the workforce of the many jobs. Bart Christner made a profound impact. He inspired me to pursue digital media. Bart Christner motivated me in a direction that I truly believe is my dream profession. After many hours of in-depth training, two of his other classes in Web and Animation and a letter of Recommendation he wrote on my behalf, I was able to land a job as a Creative Programmer in website and graphic design at DME (Direct Mail Express) who specializes in all forms of Digital Media advertising for companies of all different sizes such as restaurants, auto stores, cosmetic surgery, dentistry, doctors offices, hospitals, and major auto nation companies (Toyota, Ford, Chevy, Dodge, and more). There are a ton of other companies and things DME does but those are just some examples. They say in life to become successful and create wealth (happiness and good income) you must find something you love and learn a way to make money doing it. Let’s just say if it was not for Bart Christner and this profound impact he had on my life, that I may have never found my true life’s passion. I would like to close with, “to become a great leader you must learn to follow first, but only follow if you know your leadership is leading you the right way.” I would say Bart Christner is a leader that I would follow any day and anywhere to become successful.